His career on the gridiron increasingly moncer. Spanish La Liga fans would know the figure of Eric Abidal. He is known as a reliable defender that strengthen the FC Barcelona and the French national team. Last May, Abidal had become the center of the news, when the club's leading Italian football, Juventus, intending to sign him from Barcelona. Unmitigated, The Old Lady-nickname-Juventus are ready to bring to Turin Abidal of Barcelona striker David Trezequet bonus. However, Barca tempting offer was rejected. Abidal is known as a left back, who has the advantage of physical strength and technical aspects, decided to keep playing at Barca until June 2012. He extended his contract with Barca which originally expired in 2011. "Buyout clause for Abidal was 90 million euros," the statement conveyed through the official website Barcelona. Abidal is one of the world's soccer players who are Muslims. Indeed, he was a Muslim convert. The star of new converts to Islam six years. Born in Lyon, France, on 11 September 1979, Abidal are from immigrant families from Africa. Previously, Abidal is an adherent of the Catholic religion. Meeting with a woman who is now his wife has been delivered to the religion of Allah. After her marriage to Hayet Abidal, a woman from Algeria, Abidal embraced Islam. After two sentences say the creed, he changed the name to Bilal Eric Abidal. To the magazine published in Paris Match, Abidal said, Islam has encouraged him to work hard to strengthen his team. "I embraced Islam with full confidence," said the father of two children. Since converting to Islam, Abidal trying to be a devout Muslim. He never forgot the prayer. Moreover, at the headquarters of FC Barcelona, ​​Camp Nou, there are still two other players who are Muslims, ie, Seydou Keita and Yaya Toure. The tight schedule of matches that must be acted, making Abidal less constrained when running in full fasting during Ramadan. Last Ramadan, when fasting Abidal decided not to defend Barca. According to him, it had to be done, as a commitment to professionalism as a player. Something similar was also done two colleagues at Barca, Seydou Keita and Yaya Toure. Even so, replace all three days of fasting in the other, after Ramadan ends. Abidal started his professional career with French soccer club, AS Monaco, on 16 September 2000. He had 22 times the bearing armband with Monaco. After that, he moved to Lille OSC. In this club, he was reunited with his former coach, Claude Puel, Lille and 62 caps. At the end of 2004, she returned to her hometown and joined the Lyonnais. He successfully led his team won two Ligue 1 titles in a row over two seasons. During his career in France, he was known as one of the best defenders in Ligue 1. At Lyon, he was playing with goalkeeper Gregory Coupet, Francois Clerc and Anthony Reveillere and two Brazilian players, Cris and Cacapa. On June 30, 2007, Abidal move to Barcelona for a fee of 15 million euros. At Camp Nou he wore the number 22 back. Since then, Abidal became the pillars of Barca players. Abidal contract value reached 90 million euros with a release clause, and Lyon will reap a bonus of 500 thousand euros if Barcelona won the Champions League for the next four years. And it happened after Barcelona beat Manchester United in Rome. The wife is the primary motivator for the husband. 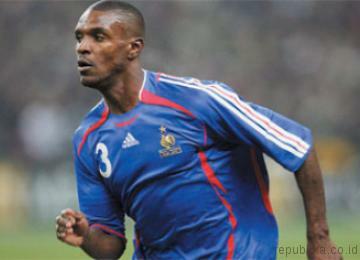 It was felt very well by the French left-back national team and FC Barcelona, ​​Eric Abidal. His success on the gridiron grazing could not be separated from the role of the wife. Motivation and support that is pumped full of wife, Hayet Abidal, has made Performance while playing the round leather increases the maximum. "To me, he (Hayet) is a gem. He is also the holder of the wheel which is amazing. I was lucky to get a woman like her, who could provide direction and logical opinion before I decide crucial, including in choosing a career, "said Abidal as written by France Football. Abidal admits his move to Barcelona did not just happen. Advice 'magical' the istrilah capable of moving the heart to try their luck in the land of Matador. Imagine, without having to move to Barcelona was, Abidal have everything in France. However, in the eyes of his wife, all was not perfect. The only way, according to his wife, Abidal have a career in foreign clubs. Hayet encouraged him to join Barcelona. "I want my husband not just stare at the football club to play France. It is important for us to prepare for the future, especially after he retires. So, to become acquainted with many people in foreign countries gives many advantages. Later, we can establish a business relationship or partnership what is mutually beneficial, "said Hayet, which is known to have high business instincts. Pivotal role played by Hayet Abidal in personal life has been proven since they were married. After getting married, Abidal choose to embrace Islam after receiving intensive guidance from the wife of the original Algeria. "All the natural progress. Options converted to Islam not because of my wife, but a gift that had suddenly appeared. It really happened there. Flowing away and made me feel happy, "said Abidal. Although known as a devout Muslim, Hayet is also very close to the entertainment world. The difference is, he's very good at dividing the roles and appearances. He knew when to wear decent clothes and when to wear a beautiful dress. "I like another footballer's wife. The difference is, I do not like to dissipate or dissolve in the night. More beautiful streets and shopping together with Abidal, "said Hayet. Abidal meeting with his wife occurred when she was a teenager. These two lovebirds are then decided to get married in July 2003 ago. From the marriage, both blessed with two daughters, namely Meliana who was born in 2004 and Canelia born in 2006.